The prediction of ligand binding or protein structure requires very accurate force field potentials – even small errors in force field potentials can make a 'wrong' structure (from the billions possible) more stable than the single, 'correct' one. However, despite huge efforts to optimize them, currently-used all-atom force fields are still not able, in a vast majority of cases, even to keep a protein molecule in its native conformation in the course of molecular dynamics simulations or to bring an approximate, homology-based model of protein structure closer to its native conformation. A strict analysis shows that a specific coupling of multi-atom Van der Waals interactions with covalent bonding can, in extreme cases, increase (or decrease) the interaction energy by about 20–40% at certain angles between the direction of interaction and the covalent bond. It is also shown that on average multi-body effects decrease the total Van der Waals energy in proportion to the square root of the electronic component of dielectric permittivity corresponding to dipole-dipole interactions at small distances, where Van der Waals interactions take place. The study shows that currently-ignored multi-atom Van der Waals interactions can, in certain instances, lead to significant energy effects, comparable to those caused by the replacement of atoms (for instance, C by N) in conventional pairwise Van der Waals interactions. Van der Waals (VdW) forces, which are very important for the structure and interactions of biological molecules, are usually treated as a simple sum of pairwise inter-atomic interactions even in dense systems like proteins [1–5]. However, multi-atom VdW interactions are usually ignored. This seems to follow the Axilrod-Teller theory  which predicts a drastic (stronger than for pairwise interactions) decrease of three-atom interactions with distance; and indeed, detailed computations of single-atom liquids  and solids [8, 9] show that MB (multi-body) effects amount to only ~5% of the total energy. However, this work shows that multi-atom VdW interactions can become quite large in the presence of covalent bonds. This finding, which equally concerns atomic interactions in biological molecules and solvents, implies a necessity to revise the all-atom force fields currently used. here θ ij /|r ij |3 = (δ - 3n ij ⊗ n ij )/|r ij |3 is the usual dipole-dipole interaction tensor (where δ is the 3D unit matrix, n ij ⊗ n ij the tensor product of vectors n ij = r ij /|r ij |, and r ij = r i - r j ; i ≠ j). As is usually done (see Refs. [6, 10–12]), relatively week quadruple-dipole and so on interactions of oscillators are ignored in addition to possible inharmoniousness of the oscillators. In general, one can compute all 3n eigenvalues (Ω i )2 of 3n × 3n matrix B(and thus eigenvalues Ω i of B1/2 and their sum Sp [B1/2]) in a time proportional to (3n)3. Computationally, this solves a problem of exact calculation of VdW dispersion forces for any system of polarizable dipoles. However, to get a physical understanding of the main terms contributing to these forces, one has to consider the main terms of Sp[B1/2]. where matrix B0 corresponds to uncoupled oscillators and ΔB to weak coupling of the oscillators. Now let us consider an auxiliary matrix B λ = B0 + λΔB (where λ is a small multiplier), and present its square root, B λ 1 / 2 MathType@MTEF@5@5@+=feaafiart1ev1aaatCvAUfKttLearuWrP9MDH5MBPbIqV92AaeXatLxBI9gBaebbnrfifHhDYfgasaacH8akY=wiFfYdH8Gipec8Eeeu0xXdbba9frFj0=OqFfea0dXdd9vqai=hGuQ8kuc9pgc9s8qqaq=dirpe0xb9q8qiLsFr0=vr0=vr0dc8meaabaqaciaacaGaaeqabaqabeGadaaakeaacqWHcbGqdaqhaaWcbaacciGae83UdWgabaGaeGymaeJaei4la8IaeGOmaidaaaaa@326D@ , as a series B λ 1 / 2 = B 0 1 / 2 + λ Z 1 + λ 2 Z 2 + ... MathType@MTEF@5@5@+=feaafiart1ev1aaatCvAUfKttLearuWrP9MDH5MBPbIqV92AaeXatLxBI9gBaebbnrfifHhDYfgasaacH8akY=wiFfYdH8Gipec8Eeeu0xXdbba9frFj0=OqFfea0dXdd9vqai=hGuQ8kuc9pgc9s8qqaq=dirpe0xb9q8qiLsFr0=vr0=vr0dc8meaabaqaciaacaGaaeqabaqabeGadaaakeaacqWHcbGqdaqhaaWcbaacciGae83UdWgabaGaeGymaeJaei4la8IaeGOmaidaaOGaeyypa0JaeCOqai0aa0baaSqaaiabicdaWaqaaiabigdaXiabc+caViabikdaYaaakiabgUcaRiab=T7aSjabhQfaAnaaBaaaleaacqaIXaqmaeqaaOGaey4kaSIae83UdW2aaWbaaSqabeaacqaIYaGmaaGccqWHAbGwdaWgaaWcbaGaeGOmaidabeaakiabgUcaRiabc6caUiabc6caUiabc6caUaaa@4724@ , where B 0 1 / 2 MathType@MTEF@5@5@+=feaafiart1ev1aaatCvAUfKttLearuWrP9MDH5MBPbIqV92AaeXatLxBI9gBaebbnrfifHhDYfgasaacH8akY=wiFfYdH8Gipec8Eeeu0xXdbba9frFj0=OqFfea0dXdd9vqai=hGuQ8kuc9pgc9s8qqaq=dirpe0xb9q8qiLsFr0=vr0=vr0dc8meaabaqaciaacaGaaeqabaqabeGadaaakeaacqWHcbGqdaqhaaWcbaGaeGimaadabaGaeGymaeJaei4la8IaeGOmaidaaaaa@31A0@ is a diagonal matrix with 3D blocks ( B 0 1 / 2 MathType@MTEF@5@5@+=feaafiart1ev1aaatCvAUfKttLearuWrP9MDH5MBPbIqV92AaeXatLxBI9gBaebbnrfifHhDYfgasaacH8akY=wiFfYdH8Gipec8Eeeu0xXdbba9frFj0=OqFfea0dXdd9vqai=hGuQ8kuc9pgc9s8qqaq=dirpe0xb9q8qiLsFr0=vr0=vr0dc8meaabaqaciaacaGaaeqabaqabeGadaaakeaacqWHcbGqdaqhaaWcbaGaeGimaadabaGaeGymaeJaei4la8IaeGOmaidaaaaa@31A0@ ) ij = ω i δ if i = j, and ( B 0 1 / 2 MathType@MTEF@5@5@+=feaafiart1ev1aaatCvAUfKttLearuWrP9MDH5MBPbIqV92AaeXatLxBI9gBaebbnrfifHhDYfgasaacH8akY=wiFfYdH8Gipec8Eeeu0xXdbba9frFj0=OqFfea0dXdd9vqai=hGuQ8kuc9pgc9s8qqaq=dirpe0xb9q8qiLsFr0=vr0=vr0dc8meaabaqaciaacaGaaeqabaqabeGadaaakeaacqWHcbGqdaqhaaWcbaGaeGimaadabaGaeGymaeJaei4la8IaeGOmaidaaaaa@31A0@ ) ij = 0 if i≠j, and matrices Z1, Z2,... have to be calculated. This system can be solved recursively: equation MZ + ZM = Y (where matrices consist of equal-size blocks (M) ij , (Z) ij , (Y) ij , i, j = 1, ..., n) unambiguously determines Z for any Y when M = ||ω i δ ij δ|| is a positively determined diagonal matrix: ( M Z + Z M ) i j = ∑ p [ ω i δ i p δ ⋅ ( Z ) p j + ( Z ) i p ⋅ ω p δ p j δ ] = [ ω i + ω j ] ( Z ) i j MathType@MTEF@5@5@+=feaafiart1ev1aaatCvAUfKttLearuWrP9MDH5MBPbIqV92AaeXatLxBI9gBaebbnrfifHhDYfgasaacH8akY=wiFfYdH8Gipec8Eeeu0xXdbba9frFj0=OqFfea0dXdd9vqai=hGuQ8kuc9pgc9s8qqaq=dirpe0xb9q8qiLsFr0=vr0=vr0dc8meaabaqaciaacaGaaeqabaqabeGadaaakeaacqGGOaakcqWHnbqtcqWHAbGwcqGHRaWkcqWHAbGwcqWHnbqtcqGGPaqkdaWgaaWcbaGaemyAaKMaemOAaOgabeaakiabg2da9maaqafabaWaamWaaeaaiiGacqWFjpWDdaWgaaWcbaGaemyAaKgabeaakiab=r7aKnaaBaaaleaacqWGPbqAcqWGWbaCaeqaaGGabOGae4hTdqMaeyyXICTaeiikaGIaeCOwaOLaeiykaKYaaSbaaSqaaiabdchaWjabdQgaQbqabaGccqGHRaWkcqGGOaakcqWHAbGwcqGGPaqkdaWgaaWcbaGaemyAaKMaemiCaahabeaakiabgwSixlab=L8a3naaBaaaleaacqWGWbaCaeqaaOGae8hTdq2aaSbaaSqaaiabdchaWjabdQgaQbqabaGccqGF0oazaiaawUfacaGLDbaaaSqaaiabdchaWbqab0GaeyyeIuoakiabg2da9iabbUfaBjab=L8a3naaBaaaleaacqWGPbqAaeqaaOGaey4kaSIae8xYdC3aaSbaaSqaaiabdQgaQbqabaGccqGGDbqxcqGGOaakcqWHAbGwcqGGPaqkdaWgaaWcbaGaemyAaKMaemOAaOgabeaaaaa@731B@ , and from [ω i + ω j ](Z) ij = (Y) ij = (Y) ij we have (Z) ij = (Y) ij /(ω i + ω j ). can be presented as a sum of pairwise, triple, quadruple, etc. interactions (the term Sp[ Z 1 ] = ∑ i Sp[ h i i ] MathType@MTEF@5@5@+=feaafiart1ev1aaatCvAUfKttLearuWrP9MDH5MBPbIqV92AaeXatLxBI9gBaebbnrfifHhDYfgasaacH8akY=wiFfYdH8Gipec8Eeeu0xXdbba9frFj0=OqFfea0dXdd9vqai=hGuQ8kuc9pgc9s8qqaq=dirpe0xb9q8qiLsFr0=vr0=vr0dc8meaabaqaciaacaGaaeqabaqabeGadaaakeaacqqGtbWucqqGWbaCcqqGBbWwcqWHAbGwdaWgaaWcbaGaeGymaedabeaakiabc2faDjabg2da9maaqafabaGaee4uamLaeeiCaaNaee4waSfcbeGae8hAaG2aaSbaaSqaaiabdMgaPjabdMgaPbqabaGccqGGDbqxaSqaaiabdMgaPbqab0GaeyyeIuoaaaa@4208@ is equal to 0, since all diagonal blocks h ii ≡ 0). is a convenient dimensionless parameter for the interaction of oscillators i and k, and α i = e2/(m i ω i 2 MathType@MTEF@5@5@+=feaafiart1ev1aaatCvAUfKttLearuWrP9MDH5MBPbIqV92AaeXatLxBI9gBaebbnrfifHhDYfgasaacH8akY=wiFfYdH8Gipec8Eeeu0xXdbba9frFj0=OqFfea0dXdd9vqai=hGuQ8kuc9pgc9s8qqaq=dirpe0xb9q8qiLsFr0=vr0=vr0dc8meaabaqaciaacaGaaeqabaqabeGadaaakeaaiiGacqWFjpWDdaqhaaWcbaGaemyAaKgabaGaeGOmaidaaaaa@30FA@ ) is the electronic polarizability of atom i.
Geometrical factors that determine (a) triple and (b) one out of three quadruple interactions of three atoms: i, k, p. C is the center of the shortest (i-p) side of triangle; γ = γ pi ; ω ¯ Δ = ( ω i + ω k + ω p ) / 3 MathType@MTEF@5@5@+=feaafiart1ev1aaatCvAUfKttLearuWrP9MDH5MBPbIqV92AaeXatLxBI9gBaebbnrfifHhDYfgasaacH8akY=wiFfYdH8Gipec8Eeeu0xXdbba9frFj0=OqFfea0dXdd9vqai=hGuQ8kuc9pgc9s8qqaq=dirpe0xb9q8qiLsFr0=vr0=vr0dc8meaabaqaciaacaGaaeqabaqabeGadaaakeaaiiGacuWFjpWDgaqeamaaBaaaleaacqqHuoaraeqaaOGaeyypa0ZaaeWaaeaacqWFjpWDdaWgaaWcbaGaemyAaKgabeaakiabgUcaRiab=L8a3naaBaaaleaacqWGRbWAaeqaaOGaey4kaSIae8xYdC3aaSbaaSqaaiabdchaWbqabaaakiaawIcacaGLPaaacqGGVaWlcqaIZaWmaaa@407E@ ; ω ¯ ⇔ = [ 2 ω i + ω k + ω p + ω k ω p / 2 ω i + ω i 2 / ( ω k + ω p ) ] / 5 MathType@MTEF@5@5@+=feaafiart1ev1aaatCvAUfKttLearuWrP9MDH5MBPbIqV92AaeXatLxBI9gBaebbnrfifHhDYfgasaacH8akY=wiFfYdH8Gipec8Eeeu0xXdbba9frFj0=OqFfea0dXdd9vqai=hGuQ8kuc9pgc9s8qqaq=dirpe0xb9q8qiLsFr0=vr0=vr0dc8meaabaqaciaacaGaaeqabaqabeGadaaakeaaiiGacuWFjpWDgaqeamaaBaaaleaacqGHuhY2aeqaaOGaeyypa0Jaee4waSLaeGOmaiJae8xYdC3aaSbaaSqaaiabdMgaPbqabaGccqGHRaWkcqWFjpWDdaWgaaWcbaGaem4AaSgabeaakiabgUcaRiab=L8a3naaBaaaleaacqWGWbaCaeqaaOGaey4kaSIae8xYdC3aaSbaaSqaaiabdUgaRbqabaGccqWFjpWDdaWgaaWcbaGaemiCaahabeaakiabc+caViabikdaYiab=L8a3naaBaaaleaacqWGPbqAaeqaaOGaey4kaSIae8xYdC3aa0baaSqaaiabdMgaPbqaaiabikdaYaaakiabc+caViabcIcaOiab=L8a3naaBaaaleaacqWGRbWAaeqaaOGaey4kaSIae8xYdC3aaSbaaSqaaiabdchaWbqabaGccqGGPaqkcqGGDbqxcqGGVaWlcqaI1aqnaaa@5FA3@ . Thus, a triple interaction can be both repulsive and attractive: attractive, when atoms i, k, p stay nearly along a line; repulsive, when these atoms form an acute or right-angled triangle . is always negative (Fig. 1b), i.e., neighbor k of atom i increases attraction of i to p, and neighbor p of i increases attraction of i to k. In four-atom quadruple terms Γ ikpq , the value of -Sp[θ ik θ kp θ kp θ qi ] varies from -18 to +9 depending on the mutual arrangement all four atoms. when the "medium" consists of oscillators described at a microscopic level. Defined thus, the scalar ε ab coincides with the conventional permittivity in a uniform macroscopic medium. When the "medium" consists of oscillators described at a microscopic level, ε ab corresponds to the dielectric permittivity for the interaction of dipoles a and b via the polarizable environment. 1 ε a b 2 ≈ 1 − ∑ p ≠ a , b 2 m p ω p 2 ⋅ Sp[ g a b g b p g p a ] Sp[ g a b g b a ] = 1 − ∑ p ≠ a , b 2 α p |r a b | 3 |r a p | 3 |r p b | 3 ⋅ Sp[ θ a b θ b p θ p a ] Sp[ θ a b θ b a ] . If the sum is taken over the oscillating electrons only (while the nuclei positions are fixed), ε ab is an electronic component of dielectric permittivity. Equations  –  show that energies of pairwise, triple and quadruple interactions are proportional to ~ ℏ MathType@MTEF@5@5@+=feaafiart1ev1aaatCvAUfKttLearuWrP9MDH5MBPbIqV92AaeXatLxBI9gBaebbnrfifHhDYfgasaacH8akY=wiFfYdH8Gipec8Eeeu0xXdbba9frFj0=OqFfea0dXdd9vqai=hGuQ8kuc9pgc9s8qqaq=dirpe0xb9q8qiLsFr0=vr0=vr0dc8meaabaqaciaacaGaaeqabaqabeGadaaakeaacqWIpecAaaa@2DD5@ ω·γ ik γ ki , ~ ℏ MathType@MTEF@5@5@+=feaafiart1ev1aaatCvAUfKttLearuWrP9MDH5MBPbIqV92AaeXatLxBI9gBaebbnrfifHhDYfgasaacH8akY=wiFfYdH8Gipec8Eeeu0xXdbba9frFj0=OqFfea0dXdd9vqai=hGuQ8kuc9pgc9s8qqaq=dirpe0xb9q8qiLsFr0=vr0=vr0dc8meaabaqaciaacaGaaeqabaqabeGadaaakeaacqWIpecAaaa@2DD5@ ω·γ ik γ kp γ pi and ~ ℏ MathType@MTEF@5@5@+=feaafiart1ev1aaatCvAUfKttLearuWrP9MDH5MBPbIqV92AaeXatLxBI9gBaebbnrfifHhDYfgasaacH8akY=wiFfYdH8Gipec8Eeeu0xXdbba9frFj0=OqFfea0dXdd9vqai=hGuQ8kuc9pgc9s8qqaq=dirpe0xb9q8qiLsFr0=vr0=vr0dc8meaabaqaciaacaGaaeqabaqabeGadaaakeaacqWIpecAaaa@2DD5@ ω·γ ik γ kp γ pq γ qi , respectively, where ℏ MathType@MTEF@5@5@+=feaafiart1ev1aaatCvAUfKttLearuWrP9MDH5MBPbIqV92AaeXatLxBI9gBaebbnrfifHhDYfgasaacH8akY=wiFfYdH8Gipec8Eeeu0xXdbba9frFj0=OqFfea0dXdd9vqai=hGuQ8kuc9pgc9s8qqaq=dirpe0xb9q8qiLsFr0=vr0=vr0dc8meaabaqaciaacaGaaeqabaqabeGadaaakeaacqWIpecAaaa@2DD5@ ω is an oscillator excitation energy. The γ values are small for non-bonded contacts. Indeed, ω i ω k ω i + ω k i n γ i k = ω i ω k ω i + ω k ⋅ ( α i α k | r i k | 3 ) MathType@MTEF@5@5@+=feaafiart1ev1aaatCvAUfKttLearuWrP9MDH5MBPbIqV92AaeXatLxBI9gBaebbnrfifHhDYfgasaacH8akY=wiFfYdH8Gipec8Eeeu0xXdbba9frFj0=OqFfea0dXdd9vqai=hGuQ8kuc9pgc9s8qqaq=dirpe0xb9q8qiLsFr0=vr0=vr0dc8meaabaqaciaacaGaaeqabaqabeGadaaakeaadaWcaaqaamaakaaabaacciGae8xYdC3aaSbaaSqaaiabdMgaPbqabaGccqWFjpWDdaWgaaWcbaGaem4AaSgabeaaaeqaaaGcbaGae8xYdC3aaSbaaSqaaiabdMgaPbqabaGccqGHRaWkcqWFjpWDdaWgaaWcbaGaem4AaSgabeaaaaGccqqGGaaiieaacqGFPbqAcqGFUbGBtCvAUfeBSjuyZL2yd9gzLbvyNv2CaeHbuLwBLnhiov2DGi1BTfMBaGabaiaa9bcacqWFZoWzdaWgaaWcbaGaemyAaKMaem4AaSgabeaakiabg2da9maalaaabaWaaOaaaeaacqWFjpWDdaWgaaWcbaGaemyAaKgabeaakiab=L8a3naaBaaaleaacqWGRbWAaeqaaaqabaaakeaacqWFjpWDdaWgaaWcbaGaemyAaKgabeaakiabgUcaRiab=L8a3naaBaaaleaacqWGRbWAaeqaaaaakiabgwSixpaabmaabaWaaSaaaeaadaGcaaqaaiab=f7aHnaaBaaaleaacqWGPbqAaeqaaOGae8xSde2aaSbaaSqaaiabdUgaRbqabaaabeaaaOqaaiabcYha8jabbkhaYnaaBaaaleaacqWGPbqAcqWGRbWAaeqaaOGaeiiFaW3aaWbaaSqabeaacqaIZaWmaaaaaaGccaGLOaGaayzkaaaaaa@7357@ is normally close to 1/2, because ω i and ω k are of equal order of magnitude , and the α values are about 1 Å3 for atoms typical in proteins (0.40 Å3 for H atoms, 0.69 – 0.85 Å3 for O atoms, 0.90–0.97 Å3 for N atoms, 1.03 – 1.32 Å3 for C atoms ). Thus, the dimension less value γ is about 0.02 for the closest non-bonded contact of atoms (|r| ≈ 2.2–3.4 Å for atoms H, O, N, C ). The very small value of γ at "non-bonded" distances means that triple, quadruple, etc., non-bonded atom-atom contacts are very weak compared to those that are pairwise. However, the situation changes when the γ factor involves two atoms connected by a covalent bond. The atom-atom distance in this case is at least two times smaller than that for the closest non-bonded contact. Thus, the γ factor for covalently bonded atoms is about tenfold (see Eq. ) larger than the γ factor for the closest non-bonded contact of atoms. In this case, the energy of high-order interactions can approach that of a pairwise interaction. Taking an average estimate of γ = 0.15 for bonded atoms (that corresponds to a typical covalent bond length of 1.5 Å between chemically equal atoms with polarizability of 1 Å3), we see (Fig. 2) a significant change in the VdW interaction energy for the cost of triple and quadruple interactions of three atoms (when a pair of these atoms is covalently bonded) and, to a lesser extent, for the cost of four-atom interactions (when two pairs of atoms are covalently bonded). It is useful to mention here that one study cited herein  has already discussed the general idea that ''bond-bond'' interactions are more appropriate for conformational analysis than ''atom-atom'' interactions. 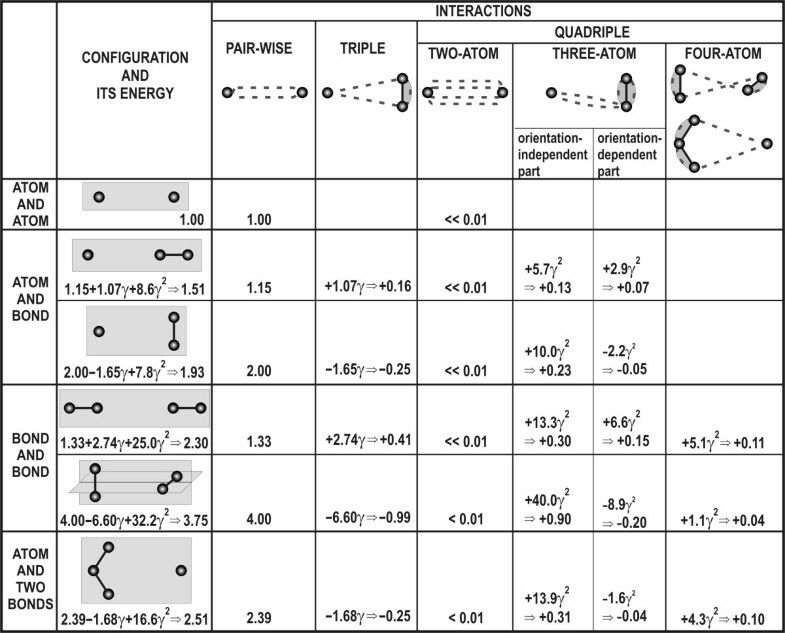 Energy of VdW interactions at various configurations of participating non-bonded and bonded atoms. The distance between the closest non-bonded atoms is 4 Å in all cases, and unity is used as the energy of pairwise interaction of atoms at 4Å distance. If the distance between the closest non-bonded atoms is |r| ≈ 4 Å, all energies presented in the Table change as (4Å/|r|)6, approximately, and their ratio does not change essentially. The value γ = 0.15 describes the coupling of oscillations in two atoms connected by a covalent bond of fixed length 1.5 Å (see text for further explanation). In the case of the collinear arrangement of atoms and bonds the attraction can grow by 70% (compare values in columns "configuration and its energy" and "pairwise" in Fig. 2), while in the case of the orthogonal arrangement of atoms and bonds, the attraction can decrease by 6%. 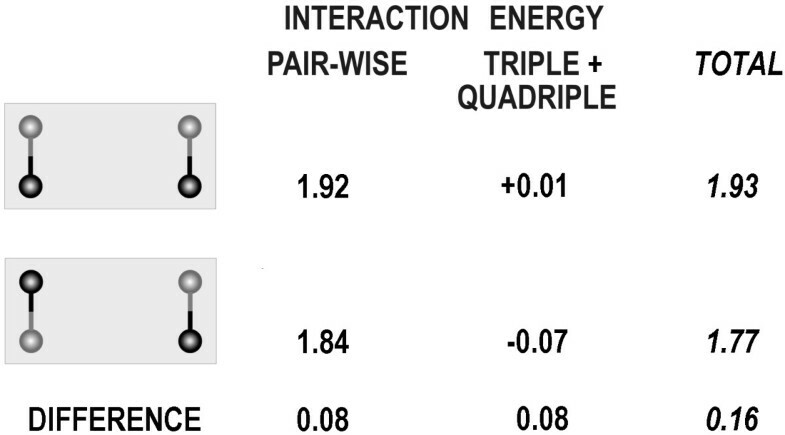 The decrease is less than the increase because, as mentioned above, the quadruple interaction is mainly attractive. The main part of this attraction is due to the three-atom quadruple interaction. This can be divided in two parts: Equation  can be presented as Sp[θ ik θ ki θ ip θ pi ] = 12 + (9cos2φ i - 3), where the first (larger) term is an orientation-independent constant (actually, it simply increases the VdW attraction of any atom involved in covalent bonding to all other atoms, see Fig. 1b; in available force fields [1–5] this term is implicitly taken into account by ascribing and fitting different pairwise attraction forces to atoms in different covalent states). The second, the orientation-dependent part equals zero if averaged in 3D space over all possible atom-to-bond orientations (see examples in Fig. 2); this part is rather similar to that for the interaction of a separate atom with a remote covalent bond (cf. Fig.1b to Fig. 1a). The orientation-dependent terms, which mainly arise from triple interactions, can increase or decrease VdW energy by ~±20–40% at extremes. This energy effect is significant, being comparable to that caused by the replacement of an N atom (α N ≈ 0.95 Å3) by a C (α C ≈ 1.2 Å3) or O (α O ≈ 0.75 Å3) atom in a pairwise VdW interaction (see equations [10,11] at ω N ≈ω C ≈ω O ). Moreover, the orientation effect is much stronger than the effect of replacing the pairwise energies of two C-N non-bonded contacts with the sum of pairwise energies of C-C and N-N contacts (α C α C + α N α N - 2α C α N ≈ 5% × α C α N ). Note that the contact replacements are the main VdW effects currently used to distinguish ''correct'' protein folds from those that are ''wrong''. Thus, we indeed see that any conformational analysis should by no means ignore the cumulative effect of the coupling of multi-atom VdW interactions with covalent bonds. Figure 3 shows that the energy difference between two structures of equal compactness may change twice due to this effect. Energy difference between two competing structures of equal compactness strongly depends on the energy terms taken into account. The light-gray atom has twice-smaller polarizability that which is dark-gray (shown in Fig. 2). All the other details are the same as in Fig. 2. It is necessary to note that at short distances, which are the most important for VdW interactions, one can expect effects of inharmonicity, higher multipole interactions, etc. [11, 12]. These effects are avoided in the "harmonic oscillator" model used in this work. Nevertheless, they exist in reality, and their existence makes the expressions obtained for many-body interactions approximate to the same extent as the conventional London's expression is for pairwise interactions. In particular, the value of γ for each covalent bond may be treated as a parameter, the value of which should be obtained from a fit of the experimental data in the same way as the London's pairwise interaction energy [11, 13, 14]. The necessity of fitting the experimental data is underlined by a relatively slow convergence of both the orientation-dependent and orientation-independent series in Figure 2. VdW forces and the electronic part of dielectric permittivity are evidently connected: both originate from dipole-dipole interactions. The relationship between VdW forces and the macroscopic dielectric permittivity of the medium is well studied in the continuum approximation [11, 14, 16]. However, this approach is useful and relatively simple when applied to large uniform bodies, like drops or layers. This work concerns interactions of small fragments composed of various atoms, and the frequency-dependent dielectric permeability, taken as a macroscopic characteristic, seems not to be an appropriate tool to investigate this case. Here we will consider an electronic part of the microscopic dielectric permittivity created by and acting at interacting harmonic oscillators, with the goal of demonstrating that multi-atom interaction creates a kind of "VdW permittivity" for pairwise VdW forces in addition to elucidating a connection between VdW forces and the electronic part of microscopic dielectric permittivity. The role of dielectric permittivity in VdW forces is ambiguous. On the one hand, the VdW interaction of two atoms is proportional to the square of the electrostatic interaction between their fluctuating electronic polarizations. Thus, one might expect the pairwise VdW interaction to be inversely proportional to the square of the electronic part of the dielectric permittivity. On the other hand, the medium's electrons (which create the electronic component of dielectric permittivity) are involved in VdW interactions of "their own" atoms, and it is not clear if they are "free" enough to influence the VdW interactions of the other atoms in such a strong manner. Thus, on average, MB effects decrease the pairwise VdW energy roughly in proportion to the square root of the electronic part of the microscopic dielectric permittivity for the dipole-dipole interaction via a polarizable atomic environment. The main effect is caused by the electronic permittivity, which is pertinent to small, atomic distances, where the main VdW interaction takes place. One can expect that the electronic component of the microscopic dielectric permittivity for interacting dipoles at these distances is significantly smaller than the electronic dielectric permittivity at macroscopic distances: the decrease in VdW energy caused by three-atom interaction in liquid argon  is approximately five-fold less than that expected the from its macroscopic permittivity. Ligand binding and protein structure prediction require especially accurate force field potentials, because one "correct" structure struggles against billions of "wrong" ones . Despite huge efforts to optimize them, the force fields currently used are still not able, in a vast majority of cases, to bring an approximate, homology-based model of protein structure (whose atoms usually deviate by only 1.5 – 3 Å from their native positions) closer to its native conformation [18–22]. At present, even the most successful methods (one or two of the five dozen methods used) show some improvement of homology models by a force field-based refinement in only a half of cases [21–23]. This shows that a "significant difficulty still exists in both sampling and force field accuracy" . One of the force field problems is that which concerns the "not well captured" balance between intramolecular and solvent dispersion (i.e., VdW) interactions . On the other hand, a partial success of modern molecular mechanics methods in the prediction of detailed protein structure shows that (i) modern, improved methods of sampling of protein chain conformations seem to work (possibly, at the cost of averaging that decreases the effect of energy errors ) in some, but not all, cases (especially when a near-native conformation basin is reached from homology modeling), and (ii) current force field quality is sufficient in some, but not all, cases, so that an increase in the accuracy of the force field seems to be crucial for the final success of protein structure prediction methods. This study shows that currently-ignored multi-atom VdW interactions can be important for the further development of force fields. The coupling of covalent bonding with multi-atom VdW interactions is not the only important MB effect. Some of those, like MB electrostatic interactions, are taken into account by the existing force fields (see [24, 25]). Here the effect is caused by the interaction of the permanent charges or permanent molecular multipoles with particles of polarizable media. The other interactions, which include interaction of permanent multipoles with induced ones , are not yet taken into account by existing force fields. The discovered specific coupling of covalent bonding with multi-atom VdW interactions does not need permanent charges or multipoles, and therefore involves the multitude of covalent bonds in molecules. Multi-atom interaction with any of the bonds can lead to a significant energy effect, which is comparable to that caused by the replacement of atoms in conventional pairwise VdW interactions. As a result, the effect described can be rather significant in choosing the molecular shape. I am grateful to D. Reifsnyder for assistance in the preparation of this paper, to A.G. Donchev for assistance in computations and to A.M. Dykhne, A.A. Vedenov, R.V. Polozov, M. Levitt and G. Vriend for seminal discussions. This work was supported in part by the Russian Foundation for Basic Research and Russian programs "Molecular and Chemical Biology" and "Leading Scientific Schools", INTAS, IHES and an International Research Scholar's Award from the Howard Hughes Medical Institute.